baggie. There must have been 10,000 calories in that box – enough to put a cavity in even my monster-sized sweet tooth! 2009. 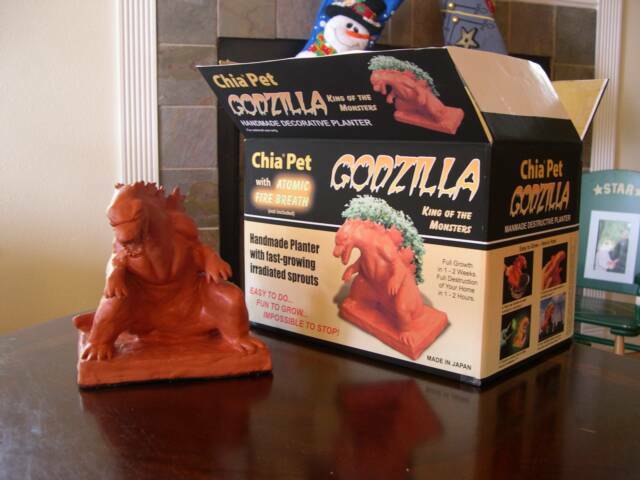 My next salvo called for a truly atrocious present, and only the King of Gag Gifts would do: a Chia Pet. I sculpted a 12” tall statue of Godzilla out of Aves Apoxie Sculpt and painted it terra cotta red. I had a lot of fun using Photoshop to create a parody of the Chia Pet graphics, which I then printed out in color and spray-glued to an existing cardboard box. Along the way, I took photos of my sculpture and doctored them to show in a sequence how the seeds, once planted in the clay and irradiated with plutonium isotopes, would eventually grow into an unstoppable killing machine. There was a hidden door in the sculpture’s base where the film was tucked securely away. 2010. Su’s answer was a mysteriously heavy package that I am sure cost more to ship than she had paid for the items inside. It was a do-it-yourself kit for a Monster Movie Night, complete with an old 8-mm projector that she had bought at the Salvation Army (complete with cobwebs and a dead spider – how appropriate! ), some microwave popcorn, movie tickets and a boxed assortment of theater -style candy, as well as a couple of movie posters and theater cards. I tried for a few days to get the projector to run, but there was something wrong with the sprockets and it kept chewing up the film, so I had to abandon the attempt. We still haven’t seen the movie, and probably never will. But that’s not the point. 2011. I returned fire the following year with a half-dozen oversized monster eggs. 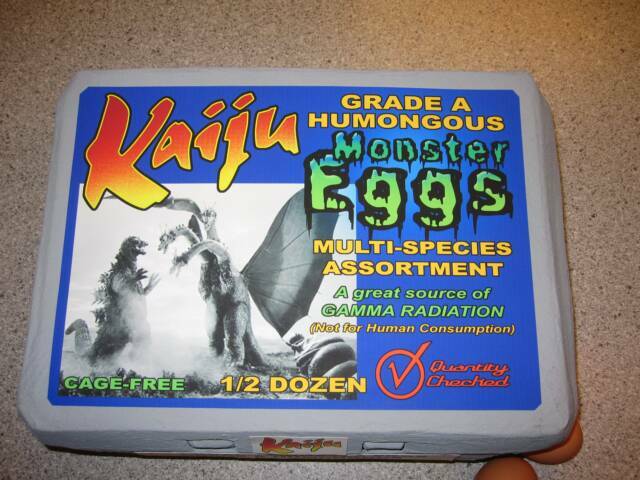 I fashioned a papier-mache egg carton about three times the size of a normal one, and put together an assortment of eggs that might have been laid by Godzilla, Mothra, Ghidora, Rodan, Gamera and even the cyborg Gigan. Some were lit inside with battery-powered Halloween candles to simulate radioactive meteors, or stippled with glow-in-the-dark paint, or in the case of Mothra, glopped together as a mass of silvery globes in clear silicone gel. The cyborg egg took the most work, as it was lit with multi-colored LEDs. I made up a custom label and tucked the film into a hidden compartment in the carton’s lid, then shipped it off to Missouri. 2012. Su and her husband Paul took that egg theme and threw it back in my face. 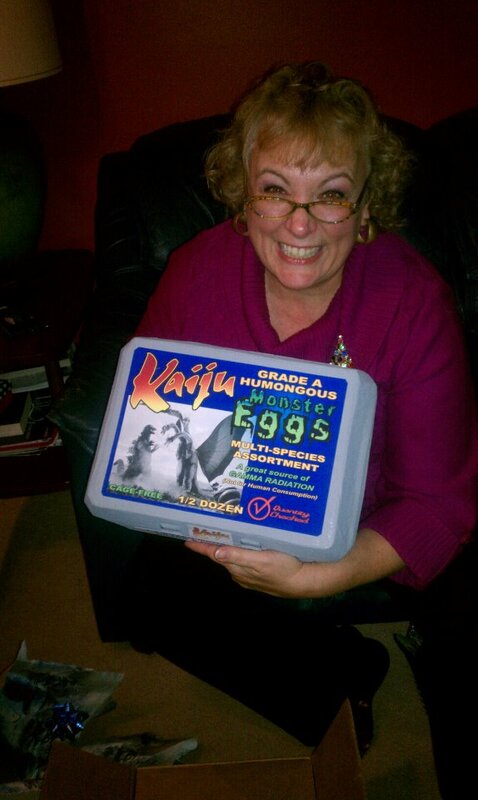 The story goes like this: The Godzilla egg I had sent them accidentally rolled off the shelf and cracked. All the king's men and their horses tried to piece it back together again, but with only limited success. What I got could best be described as Arrested Development Godzilla. 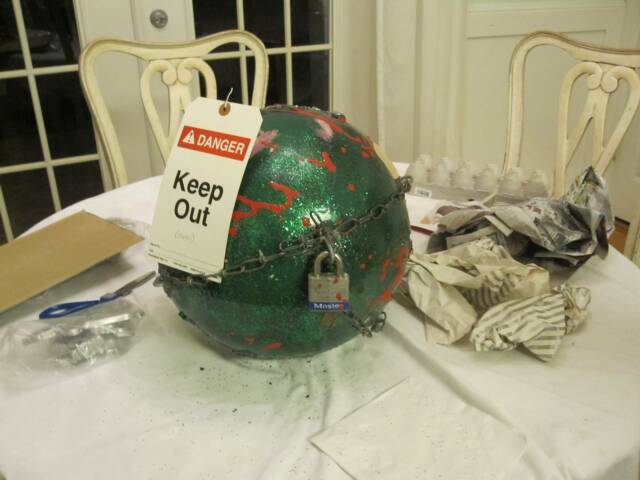 The eggshell had started life as a classroom globe before being cut it in half, painted and chained together with a padlock to keep the critter inside from hatching prematurely. 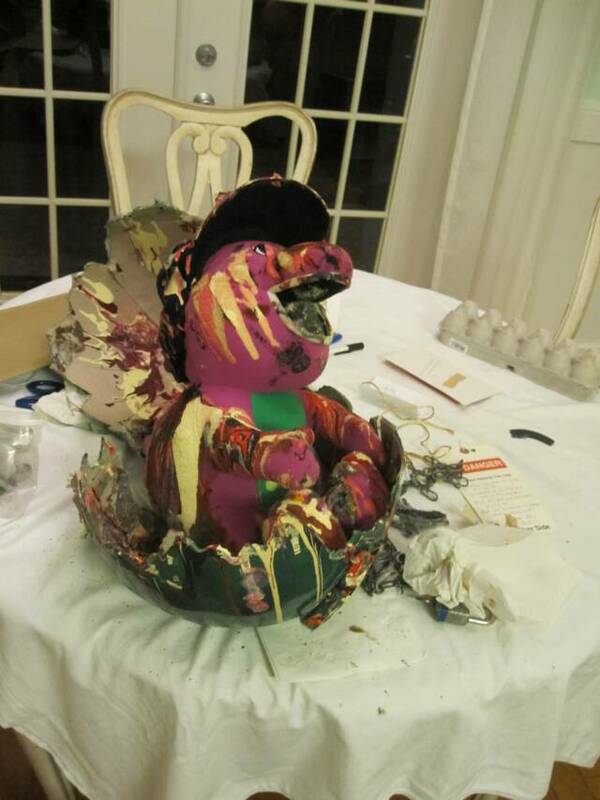 Inside was a plush Barney doll wearing a Godzilla ball cap, floating in a pool of brown acrylic house paint. -- another godzawful mess! Barney had apparently swallowed the movie, but I was able to give him a filmectomy. 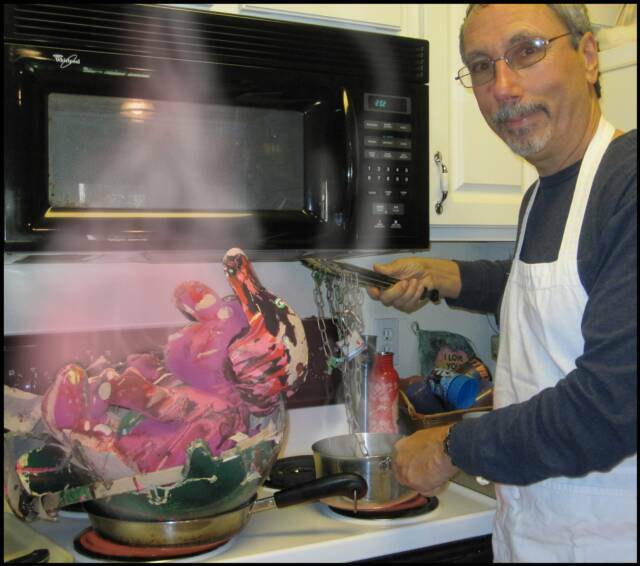 I posed for a photo, pretending to cook the whole package on the stove, and sent it to them with my recipe for a monster omelet. On our off-years, it’s hard to resist sending something extra, just for fun. So far, Su has given me three Godzilla Christmas ornaments for our tree and I sent her a plastic action figure somewhere along the line. 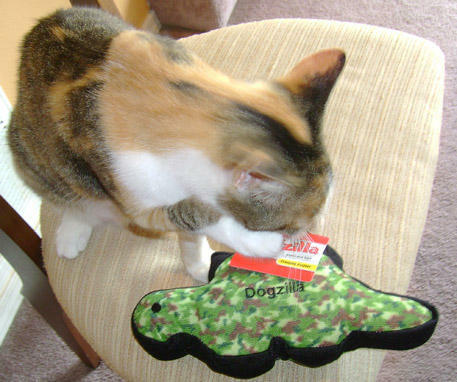 Once, I found a stuffed dinosaur doggie toy with the name “Dogzilla” on it, and explained that I thought it was some kind of typo. 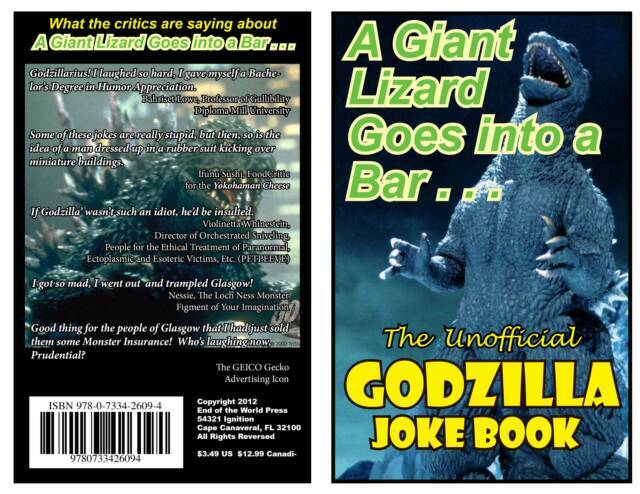 Last year, I threw together a small joke book of bad Godzilla puns and riddles entitled A Giant Lizard Goes into a Bar. . . .
2013. Now the ball is back in my court again. I don't want to spoil the surprise, but I have to admit I've put way more time and energy into this thing than I probably should have. As long as my little sister gets a big kick out of it, I don't care. Then I can sit back and wonder what kind of zany way ol' Atomic Breath will make his way back to me next year. I'm sure it will be worth the wait. 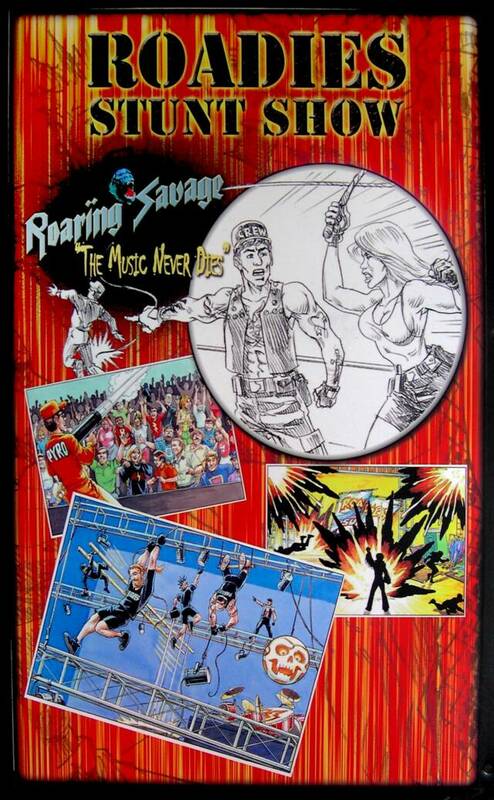 Jon Binkowski's gang at Renaissance Entertainment have always been one of our favorite clients. Not only do they throw the best parties, but even when they’re working, it’s obvious they get a kick out of what they do. So when Jon bit off a bigger chunk of the theme park market by building Hard Rock Park, we knew it was going to be a crazy ride. Fortunately for us, there was room on the magic bus for a lot of sub-contractors, and so Radical Concepts was tapped to produce storyboards for two of the park’s live shows. 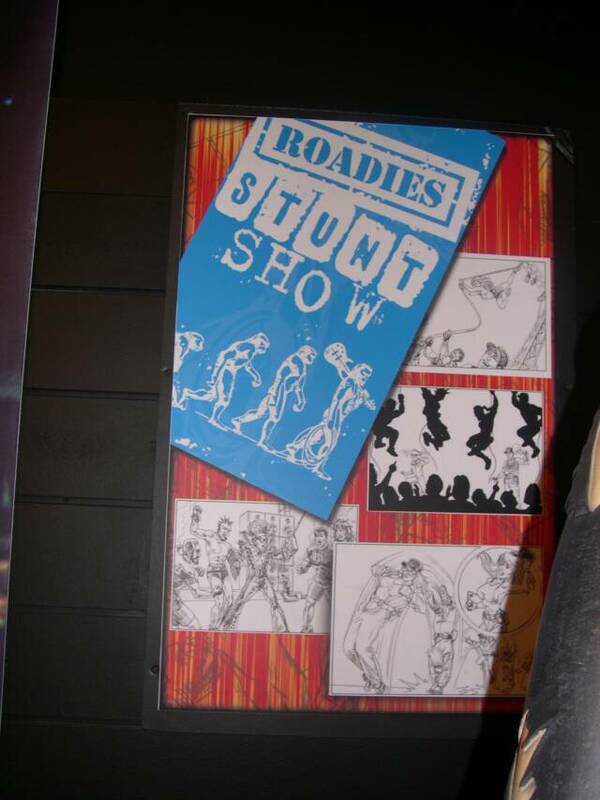 First up was the Roadies Stunt Show, an action spectacular whose characters represented the stage crew for a typical rock concert. Of course, some of the crew were more adept than others, and before long, the bumbling antics of oddball Nigel overwhelmed the efforts of the seasoned veterans to disastrous, yet hilarious, results. 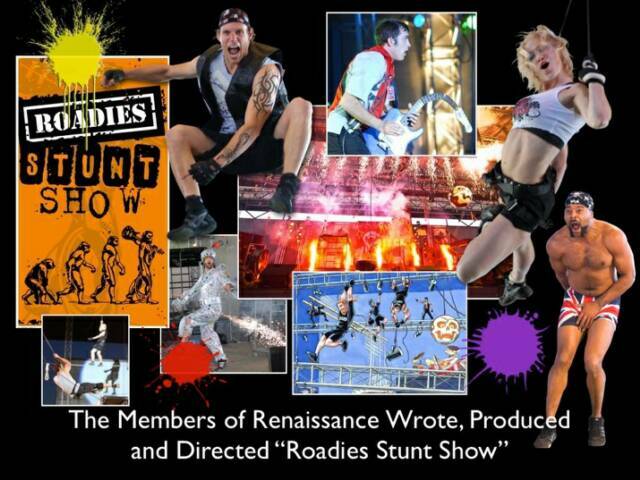 Working closely with the show’s writer, Stephen DeWoody, we helped visualize the carefully choreographed action that was to take place on a complicated system of ropes, trusses and stage props, including a trick banner that split in two at the end of the show to spell out a completely different message. And no, it wasn't "Paul is dead," or "Don't take the brown acid." 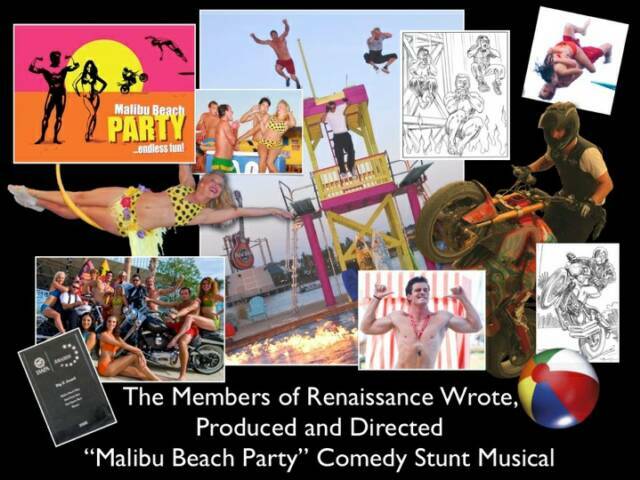 The other show was Malibu Beach Party, a musical frolic around a beachside swimming pool, complete with high dives and lots of splashes – and no shortage of bikinis. The bright colors of the set and costumes gave this whole experience a look that would fit right in with those tee-age beach movies of the early 60s, an effect that was only enhanced by the lively dancing and nostalgia-soaked soundtrack. To be sure, there was some drama in the mix, but nothing so dark that it would throw a wet blanket on this high-spirited festival of sun and sand. It was a real chore drawing all those folks in skimpy bathing suits, but we strove to maintain the frivolity of the storyline throughout the 30-odd color storyboards. Although Hard Rock Park opened to rave reviews, economic troubles forced it to close its gates after only one season. It's a pity, because this totally fun rock'n'roll attraction had a heck of a lot to offer even the most casual music fan. Even if we hadn’t been involved in any part of it, HRP would still be a place we’d like to go and rock out. When you want to impress a guest, you break out the good china. So when you want to impress your client in China, what can you do but help bring in a good many guests? That's what Matt Lenz wanted to do. A developer in Li Jiang Giulin had hired him to create a small theme park on a tiny island in the river, and all they had was a blank slate, so Matt gave us a call. Naturally, we jumped at the chance. It's not too often that we get the opportunity to dream up the whole idea, but blue-sky visualization is one of the things Radical Concepts does best. So we did a little brainstorming, and produced a list of ten theming concepts that we thought would work well in the proposed venue. The clients thought otherwise. As you may know, it's often difficult for Westerners to get into the heads of Asian customers, and what we might find intriguing could go over like a lead kite. As an example, the Chinese do not see any part of their own culture as exotic. Whereas we Americans can find plenty of appeal in the diverse sub-cultures within our own country (i.e., Wild West, Chicago Mob, Tennessee Hillbilly, etc. ), this does not seem to be the case in China. Any Asian theme was dismissed out of hand, even when we tried to apply an overlay of fantasy or science fiction (Chinese mythology, China's future in space, and so on). What we ended up designing was a technology-based theme, loosely constructed around scientific research and exploration, but without any reference to the nation iteslf. To be honest, our slate was not completely blank. We knew the size and shape of the island, of course, and had a rough idea of the climate. The client wanted a water park at one end of the park, and they had already realized that it would need a dome to allow swimming year-round at that particular latitude. 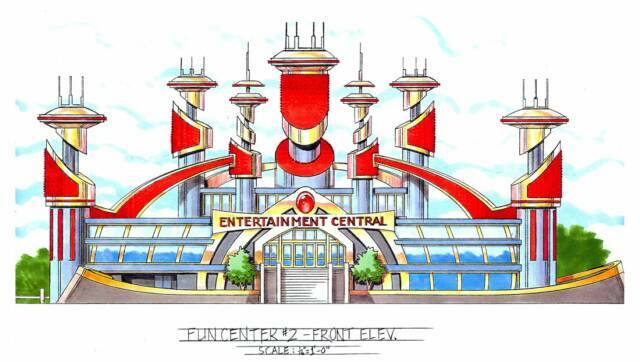 Other features we had to include were a family recreation center, an auditorium for traveling concerts and plays, and since Jurassic Park was all the rage back then, some kind of dinosaur attraction. 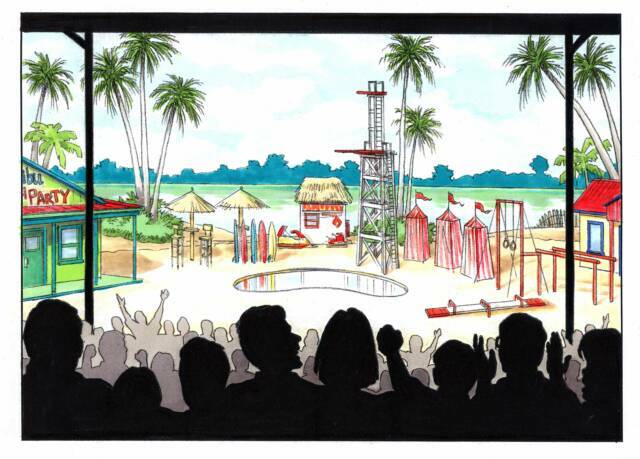 Knowing that the bulk of the budget would be devoted to the hard rides and the domed water park, we concentrated on rebranding the various rides and creating simple gateways between the distinctive areas. The main sections of the park became the Aqua Sector (water park), Energy Zone (hard ride area), Entertain-ment Central (auditorium complex), Perpetual Motion (children's play area), and our favorite, the Dragon Ranch (interactive animatronics and dinosaur rides). 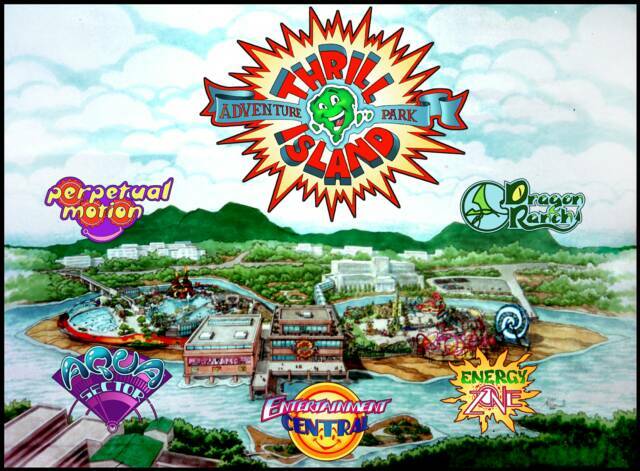 But the Thrill Island Adventure Park was never going to be -- unless the Chinese developers built it themselves. As is sometimes the case in international projects, the clients felt that the jurisdictional barriers between countries gives them the ability, if not the right, to take the creative output of foreigners and not pay them for it. So, after several unsuccessful attempts to get the clients to make good on their contract, Matt finally decided to stop working for them. He, on the other hand, had enough class to pay us for our work. It's easy to see how Integrity Attractions got its name. What makes for a good design? In my mind, it is a tasteful blend of aesthetics and practicality, of form married to function. Even in the realm of fiction (especially science fiction), a well-designed item needs to at least appear to be functional. First and foremost, it has to look like it could do the job it’s supposed to do. For instance, unless you have indicated that there are wondrous dimensional forces at your hero’s disposal, it just will not do to have his bazooka-sized weapon fold up and slip into his pocket; any blaster that slight would have to be made up mostly of empty space, which really cuts into the impression of heft that you were trying to get across by making it big. 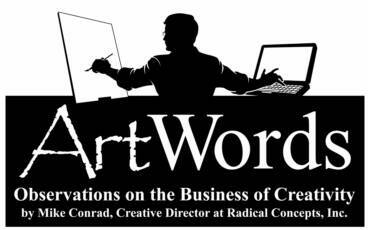 Forget Guerilla Marketing! 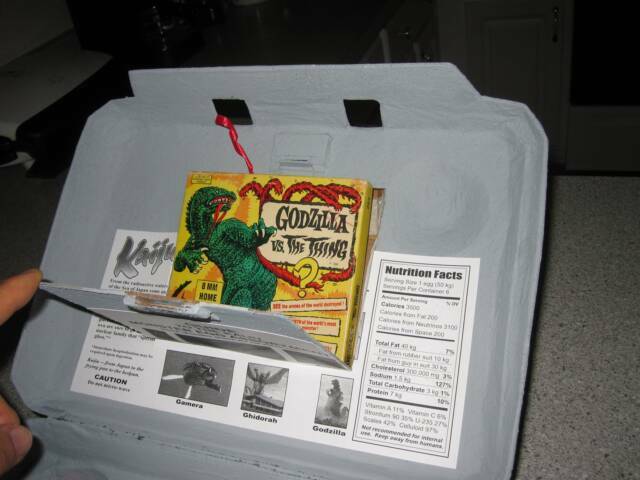 The really big returns come from Godzilla Gifting. Well, the really fun ones, anyway. After all, who can say no to an angry reptile the size of a skyscraper who's hell-bent to make his mark on your city? 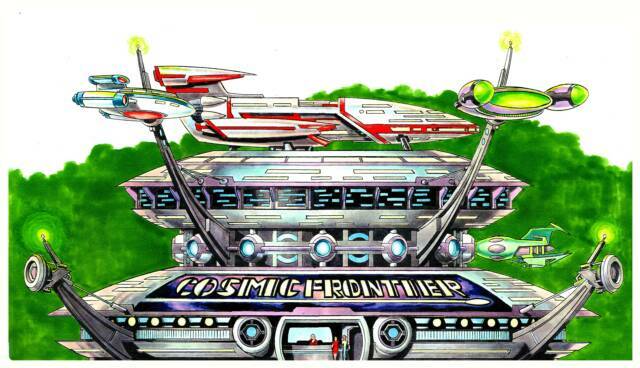 Okay, this article is not really about a new frontier in marketing. It's about two people caught up in a friendly contest to out-do each other creatively and have some monster-sized laughs along the way. And Godzilla is at the center of it all. Several years ago, I read an article online about two brothers-in-law who had maintained a rather unusual tradition for over 20 years. Seems one of the guys had received a pair of moleskin pants for Christmas and decided he didn’t like them, so the next year he re-gifted, wrapping them up and presenting them to his brother-in-law. The pants returned the following year, and soon it became a competition to see who could encase the trousers in the most outrageous wrapping, with the agreement that whoever damaged the pants while trying to open the package would be stuck with them forever. Over the years, they were twisted tightly and stuffed into a 1-inch steel pipe, soldered into metal cans, welded into a station wagon, and sealed inside tons of concrete, among other things (here’s a link to see the entire story: http://www.snopes.com/holidays/christmas/pants.asp). My younger sister and I did something like that when we were kids. 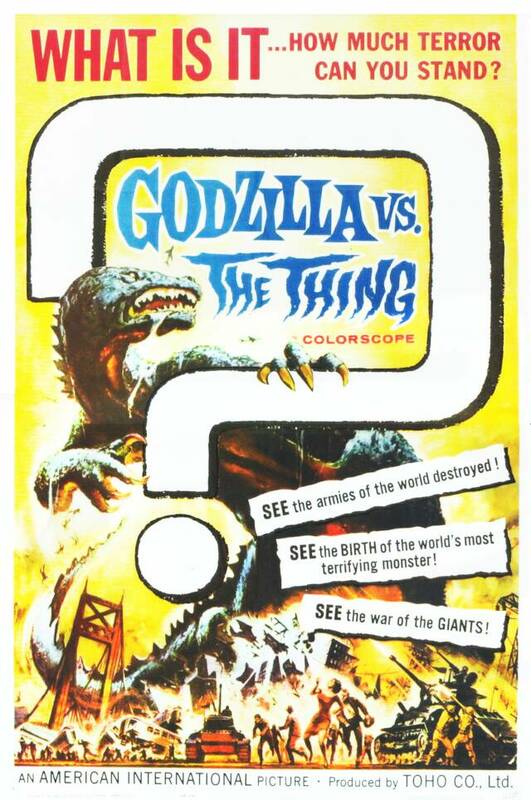 At a garage sale Susan had bought a 5-minute black-and-white 8-mm movie (the kind you could order from the back of a comic book) entitled Godzilla vs. The Thing. She gave it to me for Christmas as a gag gift. I gave it back to her the next year, taking pains to camouflage its identity. I got the darn thing back the following year, and thus began our own little game of jingle bell ping-pong. At some point – when I was about to graduate from high school, if memory serves – I called an end to the game and just took Godzilla out of circulation. Fast forward a few decades, and I was rummaging through some old boxes in anticipation of moving. 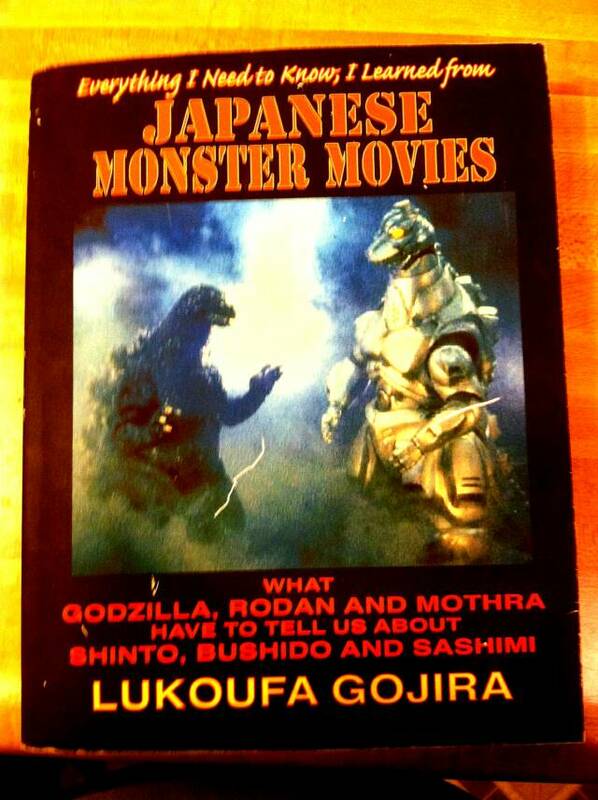 There, in the bottom of one dust-covered carton full of mementos, was the old Godzilla movie. Recalling the aforementioned tale of the travelling pants, I decided it was time to wake the sleeping giant. 2007. I carved out the interior of a book to make a place for the movie in its 5” x 5” x ½” box, then got on my computer and put together a fake cover for a fictitious book with the title Everything I Need to Know, I Learned from Japanese Monster Movies. I threw in a few jokes on the back and some photos of Godzilla that I got online, and presto! Instant best-seller. I sent it to Su with a letter inside proposing that we resume our game with a couple of new rules. One, the idea would be to try to outdo each other with creative wrapping schemes, not necessarily ones difficult to break into; and two, we’d keep the cost to a minimum, using second-hand materials as much as possible but definitely not going as far as the pants brothers, with their concrete and their welding and so on. Su thought it was a great idea. As she later explained, it was just the right mix of fun and family togetherness to help lift her out of the blues from a recent personal loss. In the spirit of the holidays, we're bringing our "Just for Fun" section up front for this issue only. "Recent Project" will return in the next edition.